Kyoto is another great city to visit while in Japan. Japan’s former imperial capital has a population just shy of one and a half million people, making it much smaller and quieter than Tokyo. 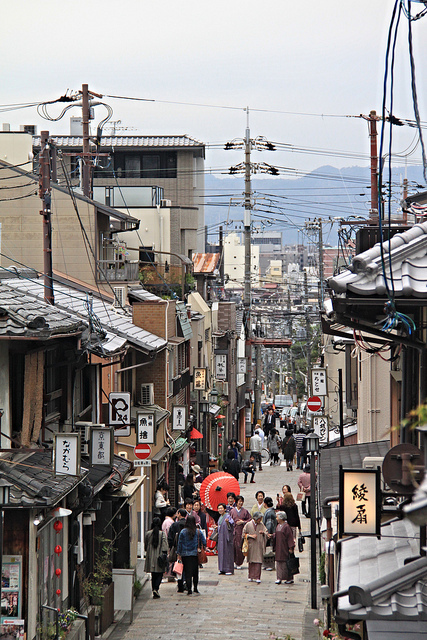 The main reason to visit Kyoto is to soak up its fascinating culture and history. 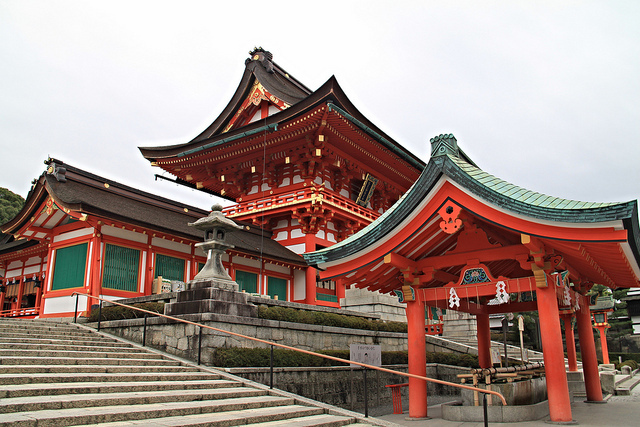 Kyoto is also the best place in Japan to go temple hopping. Why? Because it has over sixteen hundred temples! That’s a lot of temples and if you wanted to see them all you’d need to stay for months. With only four nights up our sleeves, we had limited time to experience Kyoto, but it was long enough to totally fall in love with the city. To make the most out of your visit there, here’s a list of ten wonderful things to do in Kyoto. 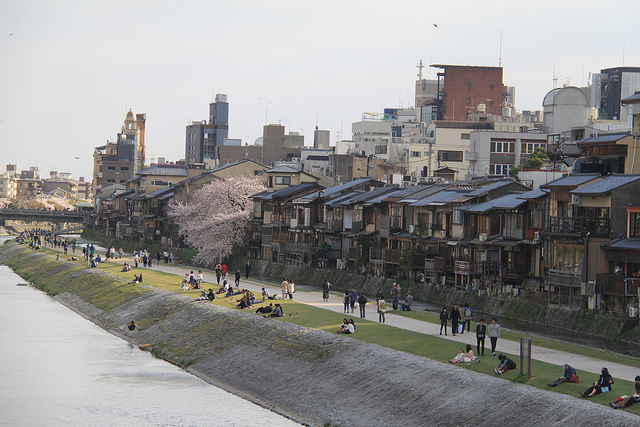 The banks of the Kamo river on a warm spring day. This was our favourite shrine in Kyoto and by far the most impressive we visited. 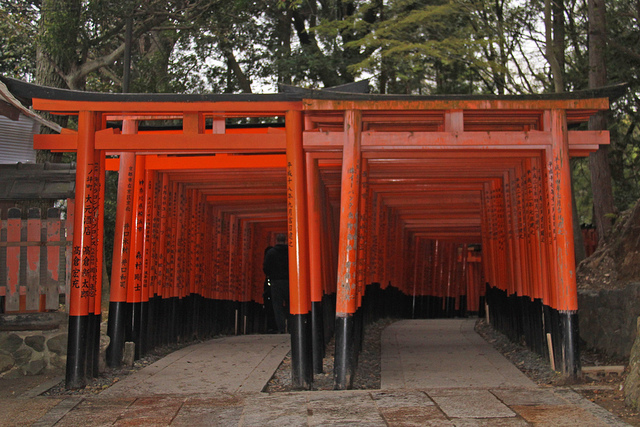 With its iconic trail of ten thousand bright orange tori gates leading up through the forest to the sacred Mount Inari, it felt quite surreal and a little mystical. The Fushimi Inari Taisha shrine. 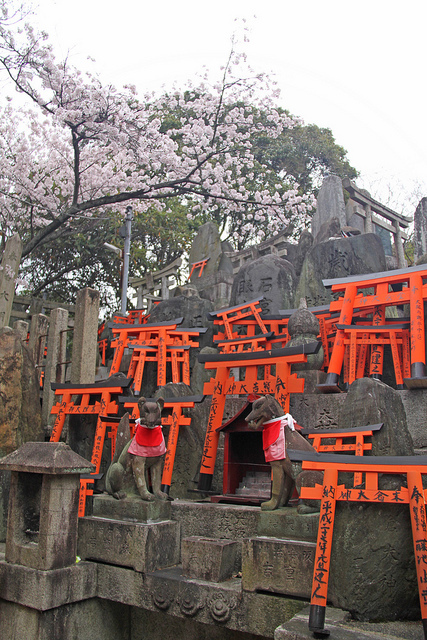 The many toris of the Fushimi Inari Taisha shrine. Each tori was donated by either a business or an individual, and their names are printed on the gates. Fushimi Inari Taisha is the most visited shrine in Kyoto, attracting thousands of businessmen annually who go there to pray for success. It also attracts many, many tourists. To avoid the crowds, try to visit either very early in the morning or late in the afternoon. That’s also when the light is at its best for photography, and this shrine is definitely one of the most photogenic places in Kyoto. The hike up and down will take you about two hours, especially if you stop frequently for photos. The best part isn’t the shrine at the top but the hike up through the gates itself. 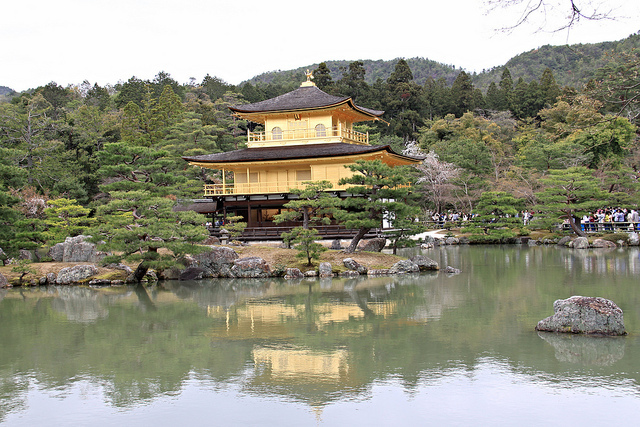 Kinkaku-ji, also known as the “Golden Pavilion”, is one of the most beautiful zen temples in Kyoto. 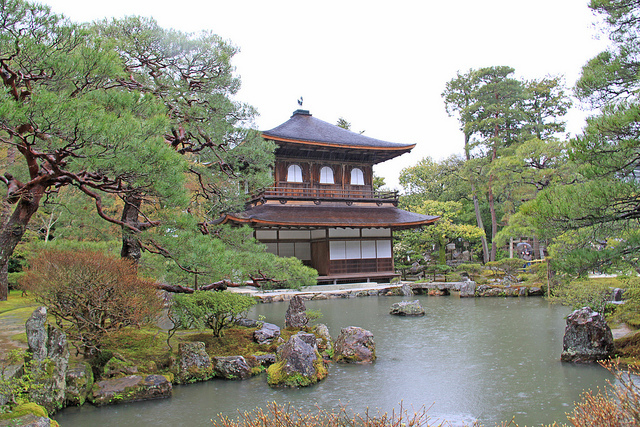 Completely covered in gold leaf and surrounded by traditional Japanese gardens and ponds, it truly is magnificent. You can’t look inside the temple but the exterior alone makes a visit there worth it. Sadly its beauty also means that it attracts the crowds and it was certainly the busiest temple we visited in Kyoto. The hordes of tourists with their cameras and selfie sticks can totally ruin the experience; so if you can, try to visit first thing in the morning. Walking in the grounds of the Golden Pavilion. 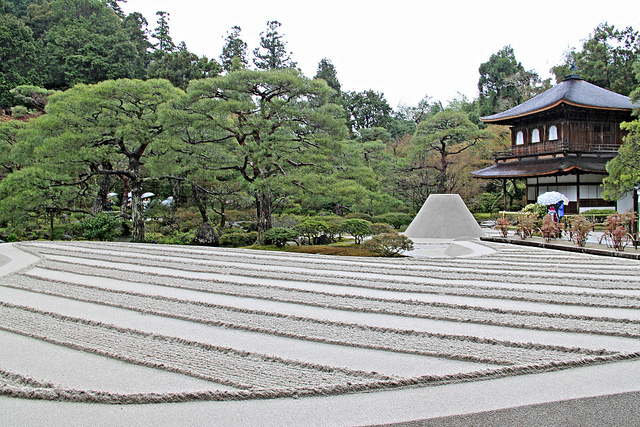 Ginkakuji is another popular zen temple. Its main building (the silver pavilion) was modelled after the Golden Pavilion itself. But it isn’t covered in silver even though its name suggests it. The temple grounds are the best part of this temple. 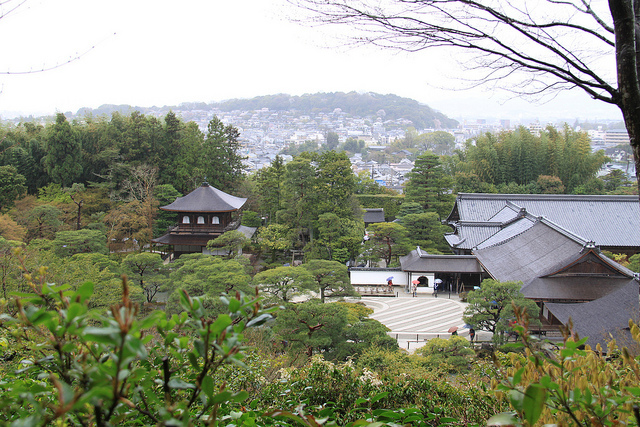 There is a beautiful walking circuit leading up to a hill that has picturesque views over Kyoto. 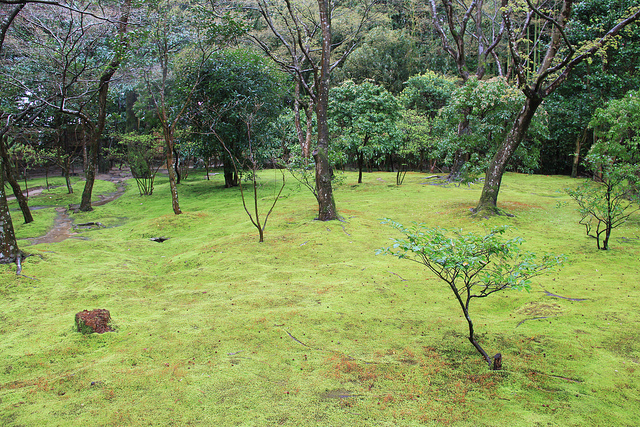 It also has a stunning moss garden and a well maintained and impressive dry sand garden. The Silver Pavilion in the pouring rain! 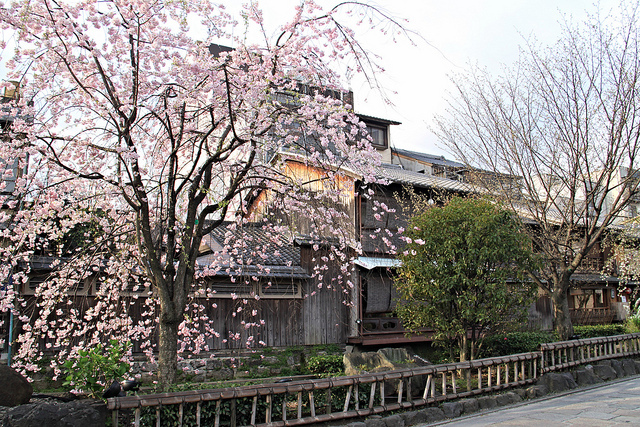 After visiting this temple, head to the Philosopher’s Path starting nearby, a two kilometre stone path that follows a canal lined with cherry trees. 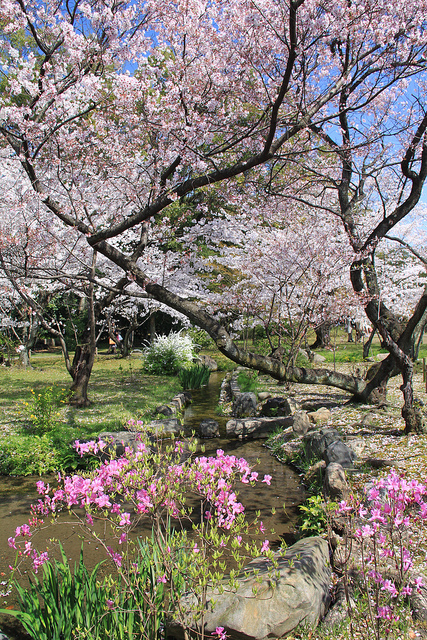 It’s the best place to see cherry blossoms during Hanami season. Sadly we didn’t get a chance to do this walk due to the terrible weather on the day we visited. The view over Kyoto from the Silver Pavilion. The Gion district is the nicest neighbourhood in Kyoto and is a must visit if you want to experience the atmosphere of ancient Japan. 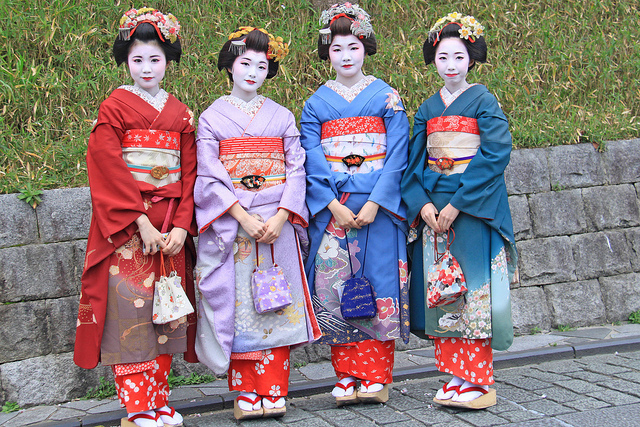 The Gion district is famous for its geishas and is one of the few geisha districts remaining in Japan. As you walk down its old streets, it is not uncommon to spot modern day geishas in their traditional kimonos walking slowly down the street on their way to work. Packed with bars, restaurants and traditional teahouses, Gion is also a great place to photograph traditional Japanese architecture. 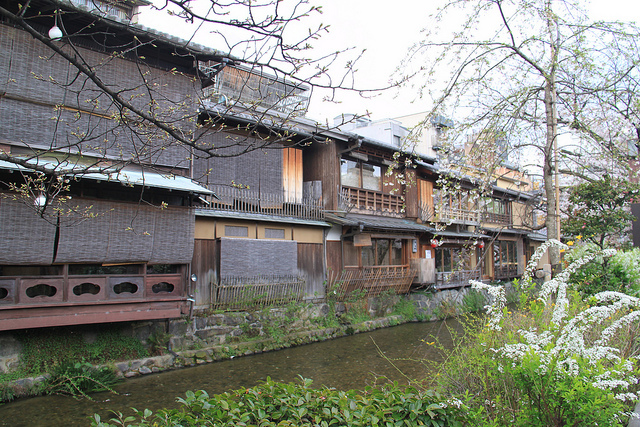 Traditional tea houses in the Gion district. 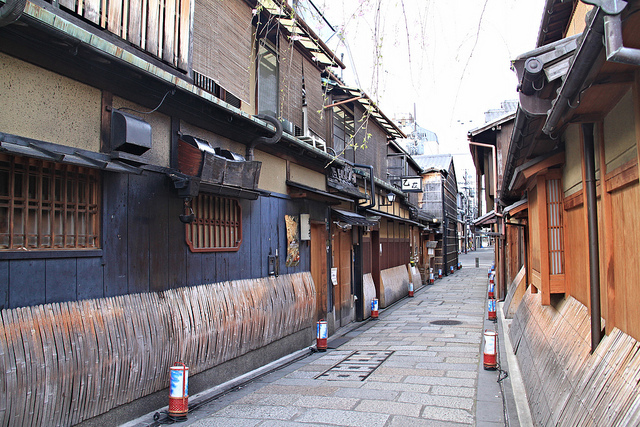 A morning walk through the empty streets of the Gion district. We rented an Airbnb studio in the Gion District. We loved staying in that part of town because we could explore the streets both early morning when they were quiet and at night when they were buzzing with tourists and locals. Cherry blossoms in the Gion district. Geisha spotting in the Gion District! 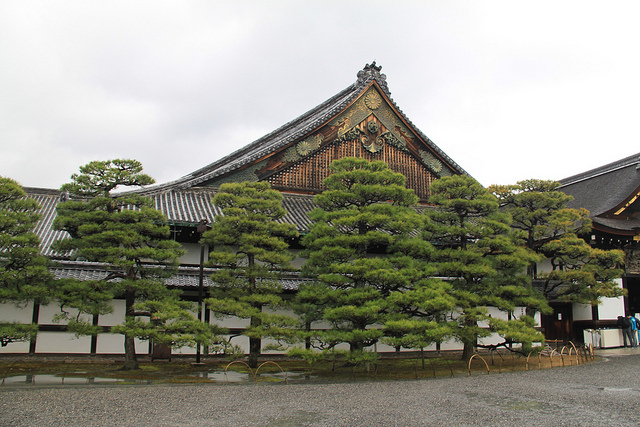 The Nijo Castle is made of three areas, the Honmaru, the Ninomaru and the stunning gardens that surround the complex. As with many castles, it is surrounded by a moat and stone walls which were built to protect the inhabitants. 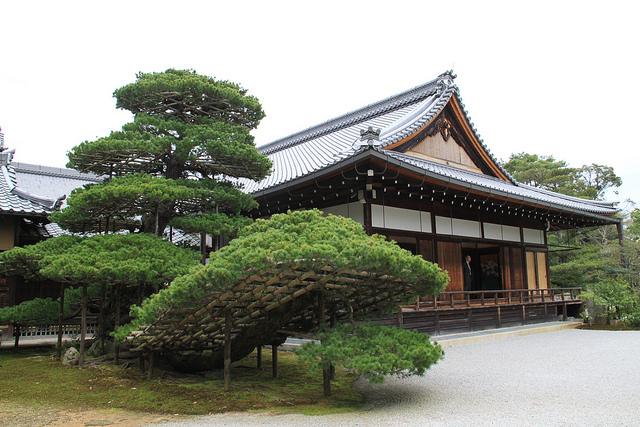 The Ninomaru palace is open to tourists and is beautifully kept even though it is empty of furniture. It is built in the traditional Japanese style and contains beautiful Japanese paintings and decorations. It is however quite humble compare to palaces you may find in Europe for example. 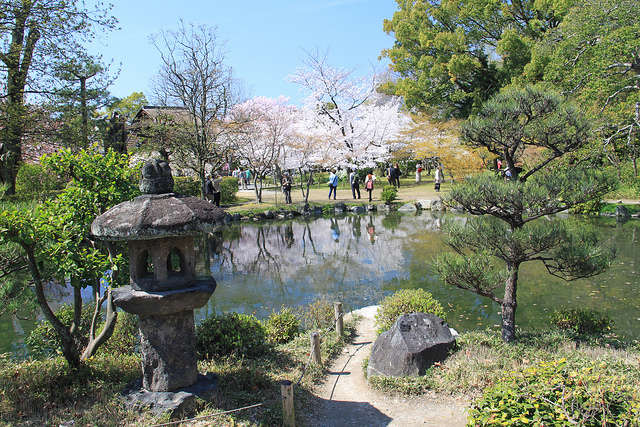 The beautifully manicured gardens are worth visiting as well, especially during Cherry blossom season when around four hundred cherry trees spring to life! The outside of the Ninomaru palace. 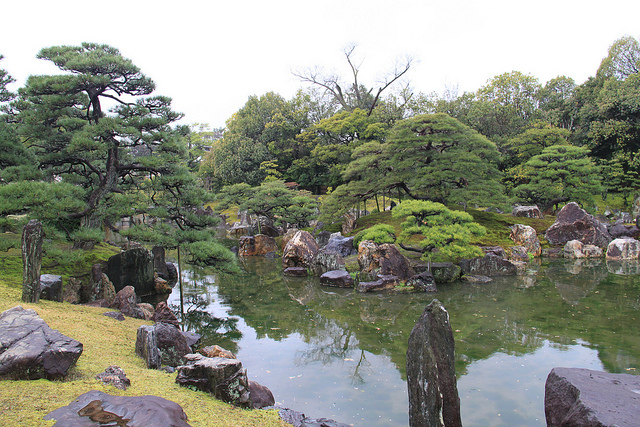 Beautiful Japanese gardens on the grounds of the Nijo Castle. Cherry blossoms at the castle! 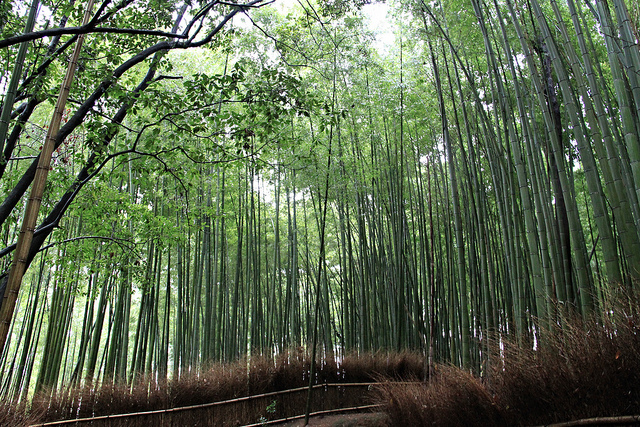 The main attraction of Arashiyama is its highly photographed walkway which passes through a forest of tall, green bamboo trees. This is a magical walk. The only catch is (and I feel like I’m repeating myself here!) that you need to get there super early; it gets really crowded and it’s almost impossible to take a decent photo. 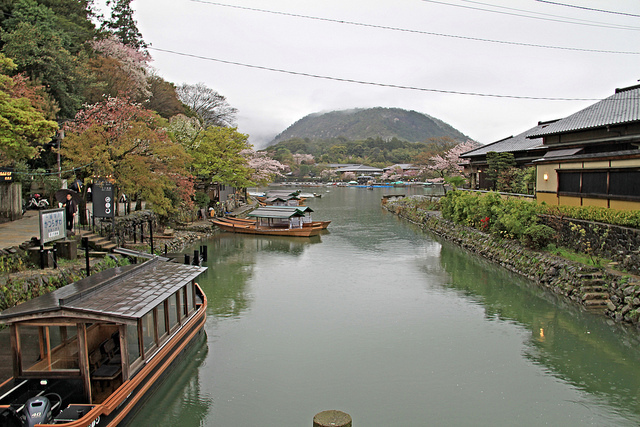 If you make your way to Arashiyama, be sure to check out the surrounding area as well because Arashiyama has plenty more to offer. It is a beautiful place dotted with picturesque temples, attractive gardens, Japanese architecture, the stunning river Oi and beautiful mountain scenery in the background. There are also many restaurants and shops there if you are hungry or want to do some souvenir shopping. 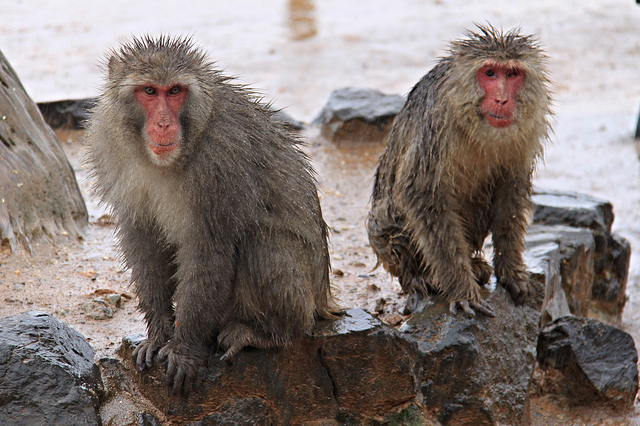 An easy stroll from Arashiyama station you’ll find the Arashiyama Monkey Park. 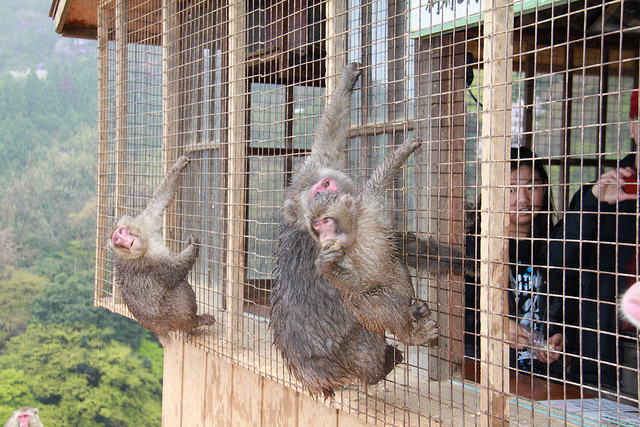 After a twenty-minute uphill hike, you’ll reach the summit to be greeted by the wild monkeys. There are lots of them in the park, both big and small and all very cheeky! Inside the feeding shed, you can buy bananas to feed them through grilled windows. For safety reasons, the monkeys can only be fed from inside the shed. I’ve had monkeys climbing all over me in Bali trying to grab the bananas I was carrying for them and it wasn’t fun. They became a little too excited! However, these particular monkeys seemed quite happy and relaxed and were having a great time playing with each other in the pouring rain. 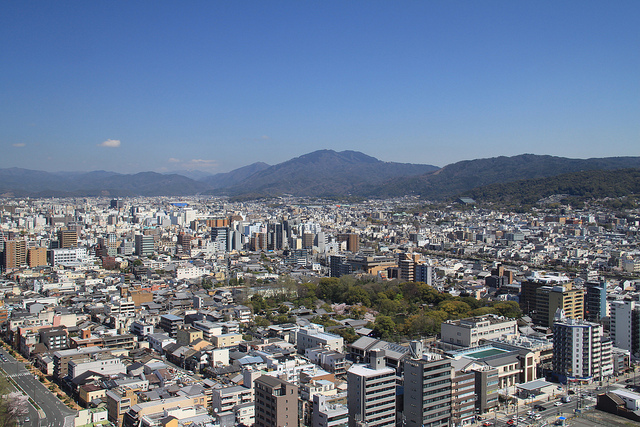 From the top of the hill you will also get a panoramic view of Kyoto; at least you will on a nice day. It was pouring when we went and we couldn’t see a thing! 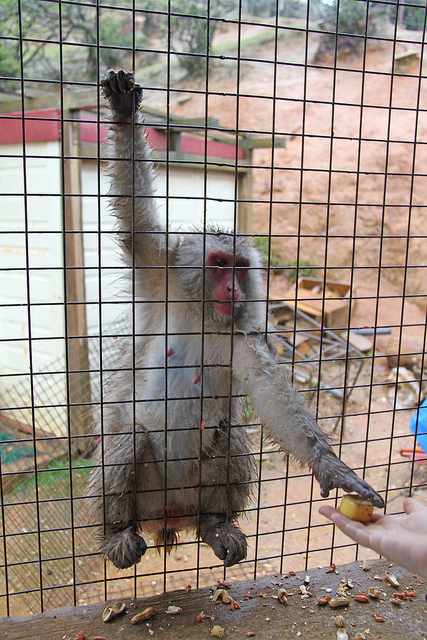 The entrance to the Monkey park is 550 yen; the bamboo forest is free. The Nishiki Market (also called “Kyoto’s Kitchen”) is a huge market where you can find all the traditional food and delicacies of Kyoto. 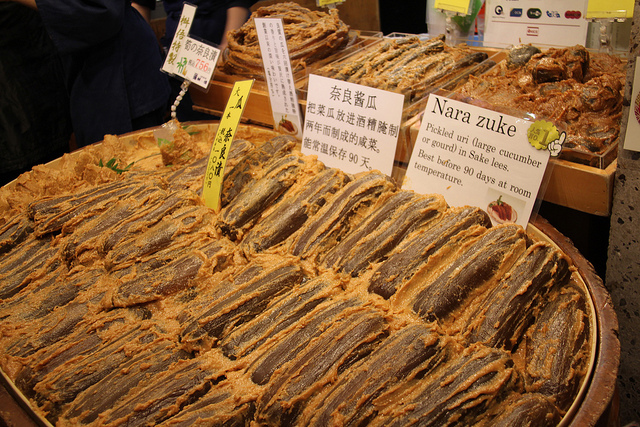 From weird vegetables to Asian spices, dried fish, freshly made sushi and even special Japanese desserts, you will find it all in Nishiki. It has over hundred stores that are spread out over five blocks. It will take you quite a while to explore it fully as you’ll be stopping often to marvel at the curious things for sale! Nishiki Market is also a great place to shop for souvenirs with many traditional souvenir stalls scattered around the market. 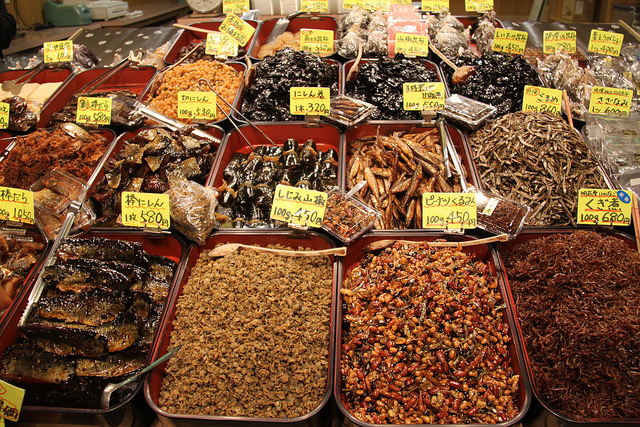 Or maybe some dried fish? For the best view over Kyoto head to the top of the Kyoto Tower. 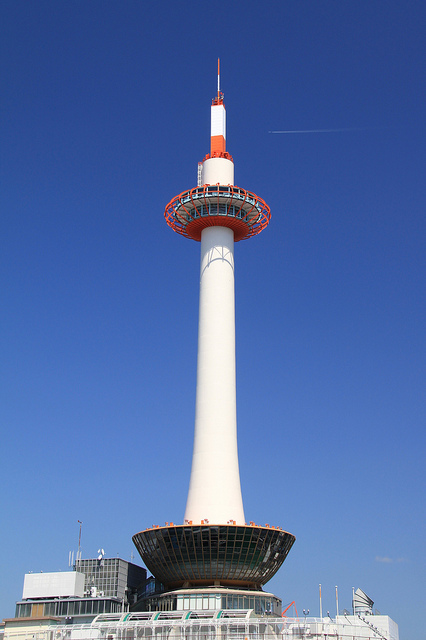 Located right across from Kyoto Station the Kyoto tower is 131 meters tall. Its modern architecture looks almost out of place in this city of ancient temples and shrines! From its observation deck a hundred meters up in the air, you’ll have a 360-degree view of the city. On a clear day, you can even see as far as Osaka! The view from the Kyoto tower. We stumbled across these beautiful gardens while we were exploring the surrounding area and the temples nearby. This is a delightful traditional Japanese garden with several bridges, a central ornamental pond, and multiple amazing photo opportunities. 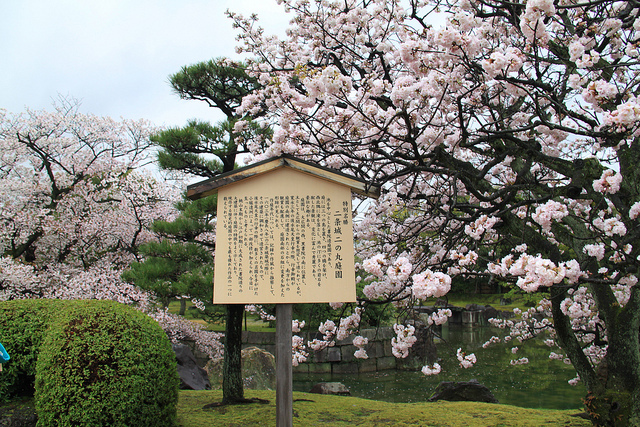 It also has many cherry trees, and if you visit during cherry blossom season as we did it’s absolutely stunning. 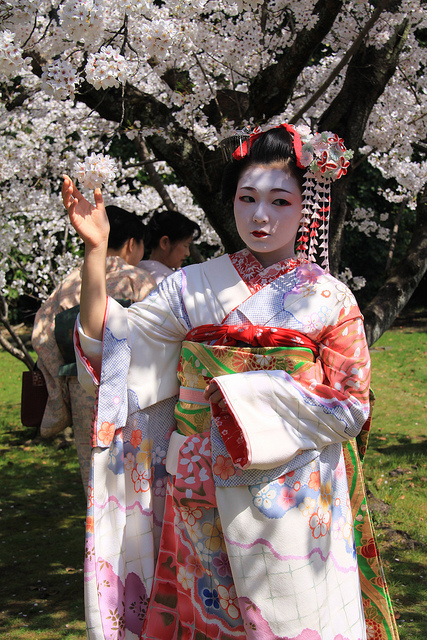 We even spotted some wannabe geishas posing under the cherry blossoms! The garden is pretty isolated and unlike many attractions in Kyoto, it isn’t very touristy. So it’s a great place to spend an hour or so. It was definitely our favourite Japanese garden in Kyoto. A wannabe geisha posing under the blossoms. 10- Eat some Japanese food! If like us you love Japanese food then you will love Kyoto. 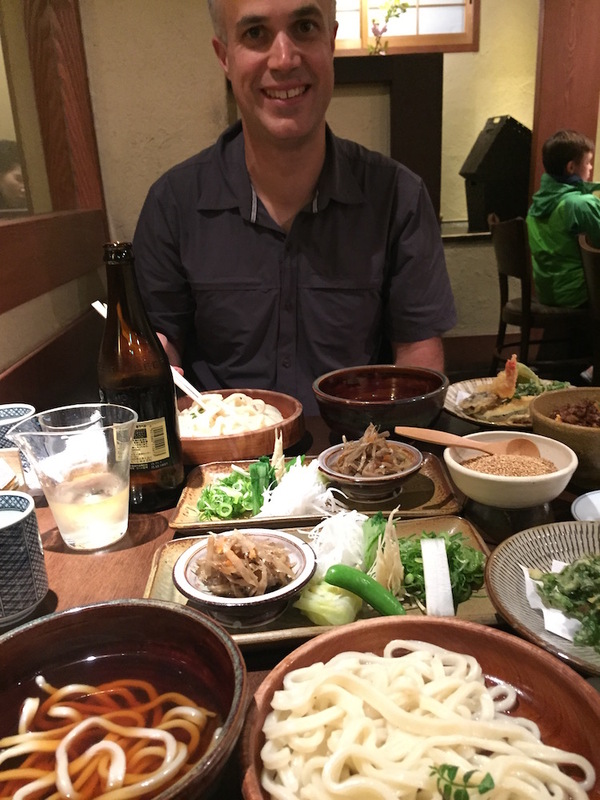 The food was so mouth watering in Kyoto that we are still dreaming about it! Chojiro: A fantastic sushi place in downtown Kyoto. In Chojiro you select and order your sushi on an iPad and shortly after a waiter delivers it to your table. The Sushis were so delicious and fresh that we went back there twice! There was way too much on the menu that I wanted to try and I needed a bigger stomach. Sigh; I so wish we had a place like this in Melbourne! Omen Shijo Pontocho: For the best traditional Udon noodles head to Omen. They have a few branches around Kyoto and they serve the best Udon noodle soup around. It was so delicious and so comforting on a cold rainy day. It took us a while to figure out how to eat it but that was all part of the fun. Make sure you get some sake to accompany your meal. So yummy! Omen Shijo Pontocho is just around the corner from Chojiro. Feasting on Udon noodles at Omen. We only had four nights in Kyoto but we felt totally immersed in the Japanese culture while we were there. It felt very different to Tokyo. The people were a lot more relaxed and even though we were terribly unlucky with the weather, we completely fell in love with the city. We reckon it’s the perfect place to go back to one day, to stay for a few weeks. This is a great list, Kyoto is such a lovely city, I only wish that I got to stay there a little bit longer when I went. The only place that I would add for people on their first trip into Kyoto is the district of Uji, but that wold make eleven things haha. Amazing photos and fantastic list! Thank you so much for your comment. Same here we also wish we had stayed longer! We can’t wait to go back one day. Thanks for the tip, didn’t check out Uji. Will do next time! Kyoto was my favorite city in Japan! I loved your photos — you captured so much of the culture. Thank you so much! Glad you liked them. The Ninomaru palace and the bamboo forest would be at the top of my list. 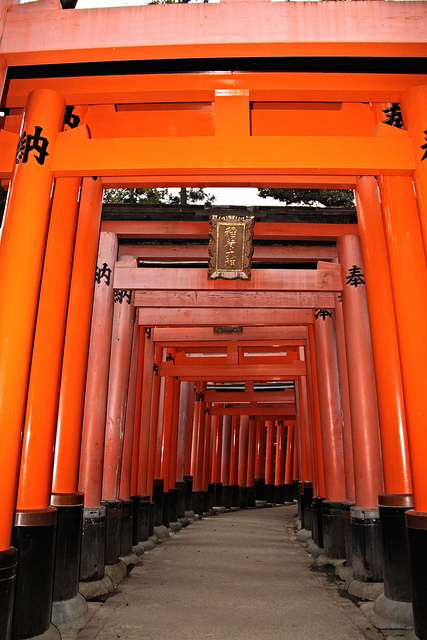 I’ve seen many photos of the orange gates before, but hadn’t realized they were in Kyoto. Very nice post, with great information! Oh, and your photos are awesome! Thank you very much for your lovely comment. Glad you found the post helpful. Thanks for the tips! My step-daughter is obsessed with Japan, and we are hoping to make it there in 2020. Thanks for the tips! 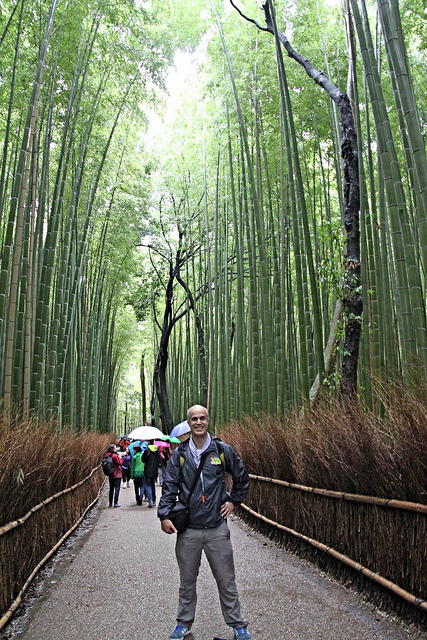 I especially want to check out Arashiyama! Hi Jenn, Thanks for your comment. I am glad you found the post helpful. I think there are more things to do there, but handpicked top 10 for us. Thanks for saving us time to decide what to do there?